Süßer rosenfarbener Mund, komm und mach mich gesund. Is this correct? I would also love any references (online or otherwise) confirming this if possible. It would be nice to tell us your sources too. Generally speaking I would agree. uñ is surely translated with und. chum vnde mache mich gesunt! There seems to be a version by the German composer Carl Orff who translated un with und as well. Yet his writing it without the tilde. Probably only for reasons to write it less confusing. It's difficult to say which which version is the "original" facsimile from the first text which appeared. I imagine it might be either vnde or un - just for practical uses. Not the answer you're looking for? Browse other questions tagged abbreviations middle-high-german or ask your own question. 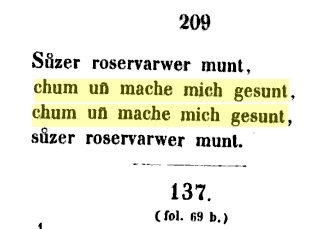 How would I translate cm (centimeter) into German? Meaning of the abbrevation “o.g.” and position in context? What does “inf” mean in German dictionaries? What does the abbreviation »ankl« mean in German?